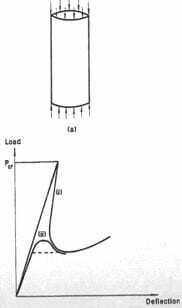 What is stability of concrete structures? 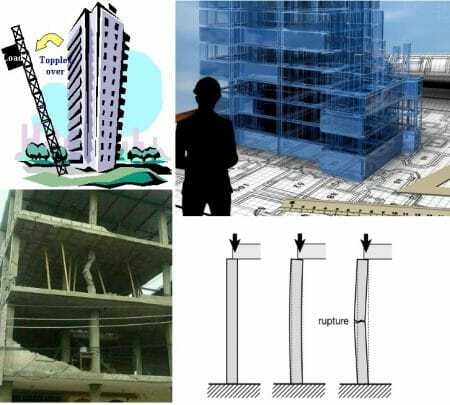 Stability of concrete structure described in different ways by different authors and researchers. For example, it is defined as the power to recover equilibrium or Resistance to sudden change, dislodgment, or overthrow. Moreover, a stable structure shall remain stable for any imaginable system of loads. That is why, load types and point of applications are not taken into considerations while a decision is made about whether a structure is stable or not. Furthermore, when a structure incapable of meeting the above requirement, geometry of structural component will change under compression, resulting in loss of ability to resist loading and it would be unstable. Instability can lead to catastrophic failure that must be accounted in design. 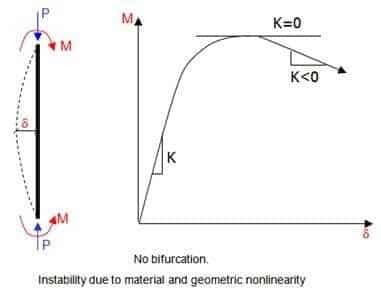 Lastly, the stability of a structure will be discussed in the following sections. It is necessary to establish stability criteria in order to answer the question of whether a structure is in stable equilibrium under a given set of loadings. If upon releasing the structure from its virtually displaced state the structure returns to its previous configuration, then the structure is in stable equilibrium. Moreover, the structure is in stable equilibrium when small perturbations do not cause large movements like a mechanism. Structure vibrates about it equilibrium position. A mechanism cannot resist loads and is of no use to the civil engineer. However, if the structure does not return to its original state following the release of the virtual displacements, the condition is either neutral equilibrium or unstable equilibrium. Therefore, structure is in unstable equilibrium when small perturbations produce large movements, and the structure never returns to its original equilibrium position. Finally, structure is in neutral equilibrium when it is not clear whether it is in stable or unstable equilibrium. Small perturbation causes large movements, but the structure can be brought back to its original equilibrium position with no work. If a force displace the ball slightly from its original position of equilibrium, it will return to that position upon the removal of the disturbing force. A body that behaves in this manner is in a state of stable equilibrium. when a disturbing force displaces the ball slightly from its position of equilibrium, it does not return but continues to move down from the original equilibrium position. In this case, the equilibrium of the ball is unstable. If disturbing force displaces the ball slightly, it neither returns to its original equilibrium position nor continues to move away upon removal of the disturbing force. This type of equilibrium termed neutral equilibrium. If the equilibrium is neutral, there is no change in energy during a displacement in the conservative force system. Change in geometry of structure under compression – that results in its ability to resist loads – called instability. Not true – this termed buckling. Buckling is a phenomenon that can occur for structures under compressive loads. The structure deforms and is in stable equilibrium (as described in point 1 above). As the load increases, the structure suddenly changes to deformation (condition explained in point 2 above) at some critical load Pcr. What has buckling to do with stability? The question is – Is the equilibrium in (Point 2) stable or unstable? 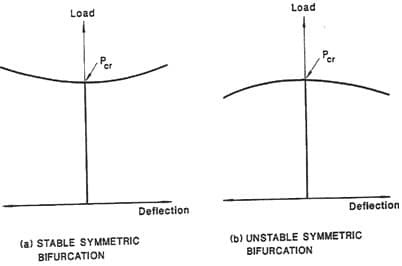 Buckling – bifurcation of equilibrium from deformation (condition 1 to condition 2 as discussed above). 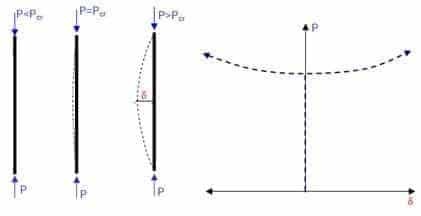 Elastic instability occurs for beam-columns, and frames subjected to gravity and lateral loads. Inelastic instability can occur for all members and the frame. The deformation changes suddenly from (condition 1 to condition 2 as discussed above). And, the equilibrium load-deformation path bifurcates. Is the post-buckling path stable or unstable? Post-buckling load-deform. paths are symmetric about load axis. If the load capacity increases after buckling then stable symmetric bifurcation. If the load capacity decreases after buckling then unstable symmetric bifurcation. Post-buckling behavior that is asymmetric about load axis. The structure stiffness decreases as the loads increases. The change is stiffness is due to large deformations and / or material inelasticity. The structure stiffness decreases to zero and becomes negative. The load capacity is reached when the stiffness becomes zero. Neutral equilibrium when stiffness becomes zero and unstable equilibrium when stiffness is negative. Structural stability failure – when stiffness becomes negative.